Hubbub - Anything Goes at the JoRo! Anything Goes at the JoRo! Anything Goes is Central Hall Musical Society's annual flagship show that is being performed in February 2017 at the Joseph Rowntree Theatre, York. The show is an exciting musical set aboard a ship sailing from New York to England and this year, we have a 75 strong company of cast, band and crew involved in the production. 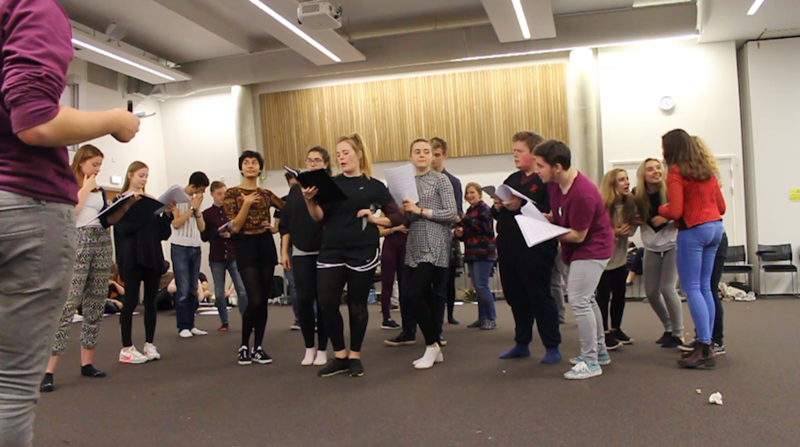 Our aim is to widen CHMS’s reach in the wider community of York by showcasing our talent off-campus whilst also providing the rare opportunity of producing and performing a show in a professional theatre. Ultimately, we aim to provide an enriched cultural and entertainment experience for all involved. Please help us achieve our goal by making a donation today! Our production of Anything Goes will evoke the broader period in which the piece is set, based upon the aesthetic of early twentieth-century America, when the show first debuted. We aim to capture the free-and-easy, fast-and-loose attitude of the Roaring 20s and the glitzy champagne-fuelled party years that followed. Not only will this be reflected in the staging of the show on the ship’s deck, but also in the costume designs, which will successfully capture the suave and classy ‘Gatsby’ look of the Jazz Age; and the use of classic dance styles in the choreography, which will be a visual feast for the audience. Being the first of the CHMS’s annual flagship shows to be off campus, we have an exciting opportunity to venture into the wider community and expand the university’s artistic presence in York. We hope to create a successful, professional-standard show which offers opportunities to a wide variety of musical theatre enthusiasts at the university. Making a success of the first off-campus flagship performance will be a significant feat for the society, and it will be a unique and valuable experience for all of those involved. Make our artistic vision a reality and donate towards our project today! Why do we need the money and your support? If we hit our minimum target of £500, we will use these funds to cover the cost of our advertising and publicity campaign both around campus and in York City Centre. This would allow us to increase our reach for the show and will aid tickets sales. This important as we're the first flagship show to perform off-campus and we have to put more effort into getting our show recognised in an already vast theatre community! If we hit our full target, this would go far in covering the extensive travel and van hire cost thus improving the logistics of our Production Week and giving us more time to rehearse in the venue allowing us to successfully and profitably run our show. We unfortunately have restricted access to our venue as it is run by volunteers therefore, the more time we can spend in the venue, the more polished the performances will be! CHMS has a earned itself a brilliant reputation both on and off-campus. In recent years, our iconic 'Feb Show' has received YUSU Awards for 'Best Event', with Jesus Christ Superstar winning in 2013 and Sweet Charity (2016) being highly commended, demonstrating the significance of our production in the university's art culture. We will be encouraging the students of the university to immerse themselves in York's city culture, by introducing them to an external theatre with a wide variety of productions. Furthermore, we intend to invite local school groups as well as older residents of York, as Anything Goes is a musical suited to all ages. Our company are enthusiastic and dedicated young people who intend on reaching all areas of York's society and promoting the show. We will receive some income from tickets sales and our fundraising efforts which include bake sales, busking and carolling, and events, to help reduce our expenditure total. We've got some great rewards up for grabs to thank you for your contribution to the production. Please do have a look and consider making a donation! Please note: Rewards including complimentary tickets to the show do not include accommodation and travel expenses. Our social media campaign is extensive being regularly updated every 2-3 days, with a variety of media, such as photos, videos and blog posts. Follow us on our social media platforms to keep up to date with the production as we progress from the rehearsal room onto the stage! Thank you for taking the time to read about our project! We know that not everyone is able to give and help support us in that way, but we would greatly appreciate it if you shared our project with anyone whom you think would be interested, whether that's on Facebook, Twitter, via email, over the phone or just in person. We want to spread the word as far we can about Anything Goes! That being said, we would like to ask you to consider making a donation to our project. Giving from as little as £1 will help us reach our target, and your invaluable contribution will benefit our production massively. Tickets are available here or via the 'Book Now' button on our Facebook Page! Select this reward and receive a thank you message on our social media pages. Select this reward and receive all rewards above as well as an Anything Goes postcard signed by the company thanking you for your support and we'll mail it out to you! Select this reward and receive all rewards above as well as with 2 complimentary tickets to a performance of your choice! Select this reward and receive all rewards above as well as with 2 complimentary tickets to a performance of your choice, and a personalised video message from the company that we'll send via email! Select this reward and receive all rewards above, with 3 complimentary tickets to a performance of your choice, and a credit in our show documentary as a financial contributor to the production! Select this reward and receive all rewards above, with 4 complimentary tickets to a performance of your choice, and listing as a benefactor of the society with this being recognised in all CHMS show programmes for the 2016/17 academic year!